I had anchored the night in New London, Connecticut, off Long Island Sound. When heading out in the morning I wanted to take a peek at a nuclear submarine which was being built in full view from the water at the Electric Boat Works. The charts had dire warnings about restricted areas and no photographs but I really wanted to have a quick look at the sub. So I made a large slow turn around in the river which got me quite close to the sub (it was 7:30 am and nobody was around). This was an incredible place to visit. Great natural harbour, very neat (all building have to have the same colour exactly) and an interesting whale museum, restaurants and shopping. 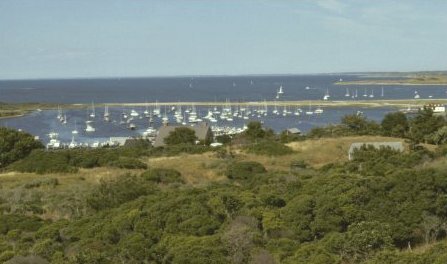 The people I met seemed to have somewhat unusual lives, they would work in Nantucket in the summer and ski resorts like Vail and Aspen in the winter doing various jobs in restaurants or teaching sailing, windsurfing, and skiing. I rented a bike as they have a super bike path right around the island. A neat thing was they had coolers filled with cold orange juice and pop all along the trail on little stands - unattended and payment based completely on the honour system! I met two girls who invited me to join them on a whale sight-seeing trip. We had the good fortune to come across some humpback whales thirty miles out in the Atlantic. It is an awesome spectacle if you have never experienced it before. 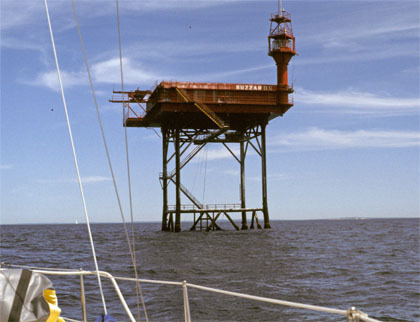 This hook of land, which protects the entrance to New York harbour, is a favourite place for cruising sailors to stay waiting for the right weather to sail down the Atlantic coast to Chesapeake Bay. I had waited a day there and the forecast for the next day was for a favourable wind, though strong. 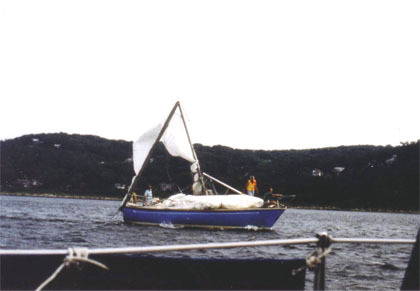 Early the next morning I had just raised my anchor and started to motor out of the harbour when a large 38' sailboat I had seen leave earlier came motoring back with its mast broken into two pieces. I thought, "Great....here I am heading out for my very first long distance ocean passage, solo, and here is this yacht almost twice my size with a broken mast after being gone just 15 minutes..."
Actually, I was not that concerned. My Contessa has one of the strongest masts and rigging for its weight of any yacht and my wine glass shaped hull would take the large waves around the headland with a much more gentle motion than the round bottom of the crippled 38 footer. I gave no thought to going back. I knew, once I was around the headland, I would have a fast and 'easy' sail down the coast with the wind almost behind me. Getting around the headland was an interesting experience. The large ocean swells hitting the shallower waters off the Highlands, and with the tide running against the wind, made for some interesting conditions. I put up just enough sail to power through the waves, set my self-steering gear, and held on tight under my Dodger. The Contessa was in her element. As expected, several large waves washed right over the boat but its motion was smooth and the narrow hull sliced through the waves with no loss of speed. It was quite exhilarating. I did have a great sail down the coast, the wind became quite light during the first night but enough to keep the boat moving at hull speed. At night, I was treated to terrific phosphorescence in the water.